Expedition Whydah has two Cape Cod facilities dedicated to archaeology, conservation, and maritime research: the Whydah Pirate Museum, Sea Lab & Learning Center in Yarmouth, Massachusetts and the Kenneth J. Kinkor Center for Research & Archaeology in Brewster, Massachusetts. In addition to the hundreds of artifacts displayed in the exhibit halls of the Whydah Pirate Museum, the Yarmouth location also houses the Sea Lab & Learning Center—an active laboratory where concretions retrieved from the sea floor are brought for conservation and eventual excavation. 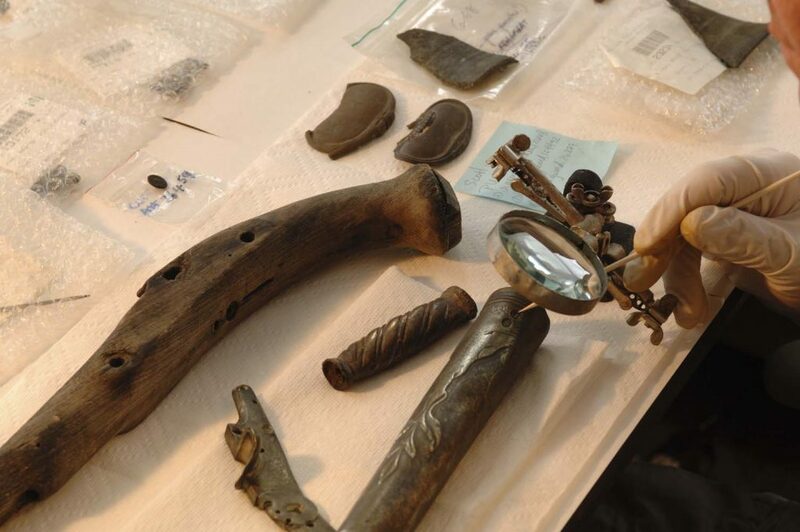 The Sea Lab & Learning Center is home to state-of-the-art equipment and is staffed by professional archaeologists who uncover, remove, and preserve artifacts in view of the general public. Guest will observe the delicate and patient process up-close and can even chat with the archaeologists while they work. The staff at the Sea Lab & Learning Center also use the facility to preform hands-on demonstrations and educational workshops. Schools and student groups interested in learning about the science, techniques, and technology used to recover underwater artifacts are welcome to schedule a workshop with our archaeologists. The Brewster location is home to the Kenneth J. Kinkor Center for Research & Archaeology, named after Expedition Whydah’s late project historian, Ken Kinkor (1954-2013). As director of research, Ken Kinkor located and compiled hundreds of primary sources that were used to construct and validate the history of the Whydah and the pirates who captured her. The Kenneth J. Kinkor Center for Research & Archaeology contains the most authoritative collection of historical documents on the Whydah pirates anywhere in the world and is the headquarters of ongoing research projects. The Brewster facility also contains laboratory equipment for the storage of concretions and artifacts recovered during the current dive season. While the Kenneth J. Kinkor Center for Research & Archaeology is not open to the public, schools and student groups interested in learning about the Golden Age of Piracy, the Transatlantic slave trade, or the primary source documents used to authenticate the Whydah’s history, can schedule a workshop and/or guided tour with our historians at the Whydah Pirate Museum in Yarmouth. Beyond Cape Cod, Expedition Whydah has also funded and refurbished a museum and laboratory in Sainte-Marie, Madagascar, which houses an exhibition on piracy off the African coast. Additionally, the Sainte-Marie facility serves as a permanent maritime archaeology base, ensuring that nearby shipwrecks can be excavated and conserved effectively and efficiently. Expedition Whydah hopes this facility will empower local researchers and archaeologists, and enhance their capacity for shipwreck preservation, tourism, and education.